Goon took me by surprise and it has the honour of being the best film I have seen this year it also has the honour of being the only new release I had seen at the time I wrote this. Sports based films have a real challenge, as we pretty much know the arc - scrappy underdog overcomes challenges to either win, or win you over. And pretty much almost every variation on theme has been attempted in some form or other. Since Rocky the skill in the sport has taken a back seat and become a vehicle to the emotions of the characters motivations aka heart. Which means - that for a sports related film to be relevant they now need to be based on or at least inspired by actual events. Although Goon is based on actual events - The True Story of an Unlikely Journey into Minor League Hockey by Doug Smith and Adam Frattasio in almost every other regard it differs. Most notably it presents the sport at its heart (of which I no nothing about) as an exciting experience and rather than try show the dark side or the underbelly which the public never sees a standard device for these type of films – it whole heartedly revels in celebration of Ice Hockey and the cringe worthy bloody violence that it wroughts. Goon made the game exciting and I could easily understood why fans love it and players want to be part of it. Something else that I really enjoyed about Goon that permeates the filmmaker approach throughout is that it isn’t watered down for the tween market. That doesn’t mean that it is a mature film look at life but inventive and fun for a mostly ignored audience. I was laughing through most of the film punctuated with grimaces and the scenes of ultraviolence (which were mostly funny as well). I usually approach sports films with some hesitation, if at all and you’ll notice reviews of sports related films lacking on The Establishing Shot. But when I heard that Jay Baruchel and to a lesser extend Seann William Scott were teaming up I was interested. Both are vastly talented and engaging performers. Granted while Seann William Scott has been in a number of successful films and seems to be able to adapt to anything thrown at him it still feels like he hasn’t quite found his groove yet and not straying to far from the successful Stiffler formula. On the other hand Baruchel is mostly the best thing about the films he is in if you haven’t seen it I highly recommend you watch She's Out of My League after Goon. Teaming up with Evan Goldberg one of the writers behind Superbad meant that the Goon was shaping up. Then I saw the trailers which made the Goon seem to unashamedly revel in its fun fresh approach - I was sold. Goon starts with one of the most memorable opening scenes in recent films letting you know from the Establishing shot Goon let’s you know that you are in for fun with it’s wry take on a classic sports cinematography and tropes evoking nostalgia of the greatest sports film ever made - Rollerball (the original). Seann William Scott is Goon he comes from a respected and stable family, sadly Goon links itself in this respect with American Pie as his father is played by Eugene Levy, which is fun and if you are fan great but I felt slight unnecessary. Goon is not the brightest torch in the batch and gets by as a sports bar doorman much to his Doctor family’s chagrin. He doesn’t have a burning desire or the drive to be a sports star (he can’t even ice skate) but his seemingly only talent - his fast fists (& occasionally head) land him a position on the local ice hockey team. This is where his problems really start as he suddenly has to deal with a myriad of new relationship problems causing tension. And as we are immersed in the bloody and exhilarating world of Ice Hockey Goon struggles with; the dynamics of his only function within the team - to protect a gun shy former hotshot (Marc-Andre Grondin) and his fight to earn the respect of his team and family. One of the clever things about Goon is the speed the story is paced, as with it’s portrayal of ice hockey it moves fast - allowing the characters to shine without forcing them to carry heavy emotion or the story. Each develops a personality very quickly. Much of this comes down to the clever writing as well as camera work and editing. Which brings us to performances; Seann William Scott is great as the polite, self unaware & dim witted Goon and you can’t but help fall for his slow charm and really want him to succeed. Although some of his characterisation does wear a little at points. Jay Baruchel as a super fan with more trash and cuss talk than entire street Basketball team is inventive with vocabulary but came across as a little disappointingly one dimensional leaving Live Schreiber to steal the show in his relatively small part as Ross the Boss Rhea and I have to say I think this may be his finest performance of late. He says a lot with very little and his monosyllabic grunts bring emotion and depth to his role as an ageing Goon. The relationship dynamics between him and Seann William Scott’s character are cleverly rolled out, masterfully creating an itch that you are never sure will be scratched. I loved the editing and photography that play on classic sports cinematography and Goon creates a compelling atmosphere for the Ice Hockey arena; the lights, sound, ambience and energy combine to make the sports exciting. I’m unsure if it common reference in Ice Hockey but was really excited with the reference to Rollerball when Bach’s Toccata and Fugue in D minor is played near the climax. Goon really surprised me by how much I enjoyed it. 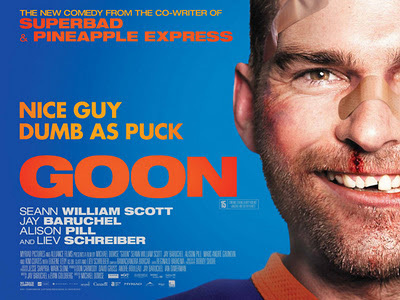 It is currently my favourite film of 2012, whether it shifts down throughout the year remains to be seen but for now if you are looking for a fun film that revels in the glory and violence of combative sports whilst paying homage to classic sports themes without parodying them I highly recommend Goon.